NASA's Orion capsule sits atop a United Launch Alliance Delta 4 Heavy rocket inside the Mobile Service Tower at Florida's Cape Canaveral Air Force Station ahead of its first test flight, which is scheduled to take place on Dec. 4, 2014. NASA's Orion space capsule is scheduled to blast off on its first test flight Thursday (Dec. 4). The unmanned mission, called Exploration Flight Test-1 (EFT-1), will send Orion zooming about 3,600 miles (5,800 kilometers) from Earth, before rocketing back to the planet at high speeds to test out the capsule's heat shield, avionics and a variety of other systems. If all goes according to plan, Orion will eventually fly farther than any Apollo capsule ever did, taking astronauts to near-Earth asteroids and — by the mid-2030s — the ultimate destination, Mars. "I gotta tell you, this is special," Bob Cabana, director of NASA's Kennedy Space Center in Florida, said about EFT-1 during a press briefing last month. "This is our first step on that journey to Mars." For example, if a problem develops aboard a spaceship in LEO, astronauts can theoretically be on the ground in less than an hour. But it would take days for a vehicle out by the moon or beyond to get home, said NASA Orion Program Manager Mark Geyer. One such capabilitiy will allow crewmembers aboard Orion to survive in their spacesuits for up to six days if the capsule gets depressurized, Geyer added. "So if we have a totally depressed cabin, they can be in their suits and we can get them home," he said. Deep-space vehicles are also exposed to higher radiation levels than vessels that stay in Earth orbit, where they are protected by the planet's magnetic field. So the shielding on Orion must be ample to safeguard the capsule's electronic equipment, Geyer said. Astronauts on deep-space missions will also return to Earth at much higher speeds than do crews that never venture beyond orbit. "So the heat shield has to be different — different materials, different thicknesses," Geyer said. "And, actually, the physics of entry changes when you come back at those higher speeds." The need to deal with those high re-entry speeds explains why Orion is a capsule, just like the spaceships that took astronauts to the moon and back during the Apollo program. "The shape is the best shape for coming in from that high speed," said Mike Hawes, Orion program manager at the aerospace firm Lockheed Martin, which built the capsule for NASA. But Orion is far from a carbon copy of the Apollo command module. For starters, it's bigger. Orion, which is designed to carry up to six astronauts, stands 10.8 feet tall (3.3 meters) and measures 16.5 feet (5 m) across the base. The three-person Apollo capsule was 10.6 feet tall by 12.8 feet wide (3.2 by 3.9 m). Orion contains 316 cubic feet (8.9 cubic m) of habitable volume, compared to 218 cubic feet (6.2 cubic m) for Apollo. Technology has also advanced a great deal since the Apollo command module was put together. "The Avcoat material, which we're using on the [Orion] heat shield, is similar to the Avcoat used on Apollo, although we have had to make some changes due to materials changes," Hawes said. "But the technology of just about everything else that we used to put in Orion and to build Orion have changed dramatically in that time. "You think of 50 years of manufacturing changes — it's a totally different world," he added. "And in fact, we do have additive-manufactured [3D-printed] parts on Orion today." The huge Saturn V rocket that blasted Apollo toward the moon was retired long ago, so Orion will rely on a different launch vehicle as well. 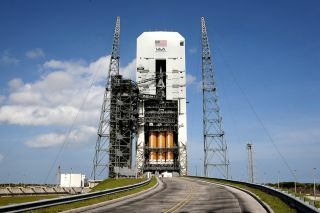 EFT-1 will use a United Launch Alliance Delta 4 Heavy rocket, but future Orion missions will ride atop NASA's Space Launch System megarocket (SLS), which is currently in development. SLS and Orion are scheduled to fly together for the first time in 2017 or 2018, on the capsule's second unmanned test flight; the duo's first manned mission should come in 2021.